Enliven your popular dishes with the heat and spice of this beef taco filling! Made from lean ground beef, this taco filling is seasoned with tomatoes, onions, and spices. Hot sauce gives this Vanee 356T3 beef taco filling a zesty kick! 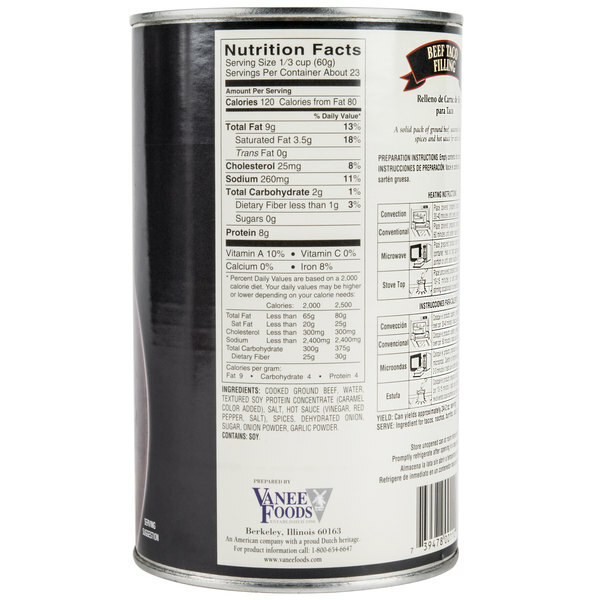 Family owned and operated since 1950, Vanee offers deliciously-consistent and convenient products at a great value. Not only is this beef taco filling great to use in soft or hard-shelled tacos, but it also enhances the flavor of popular entrees. Serve irresistible, supreme nachos at your concession stand, and garnish with shredded cheddar cheese! For something extra spicy, mix in your own blend of spices to add on to the classic recipe, or top with slices of robust jalapeno peppers. 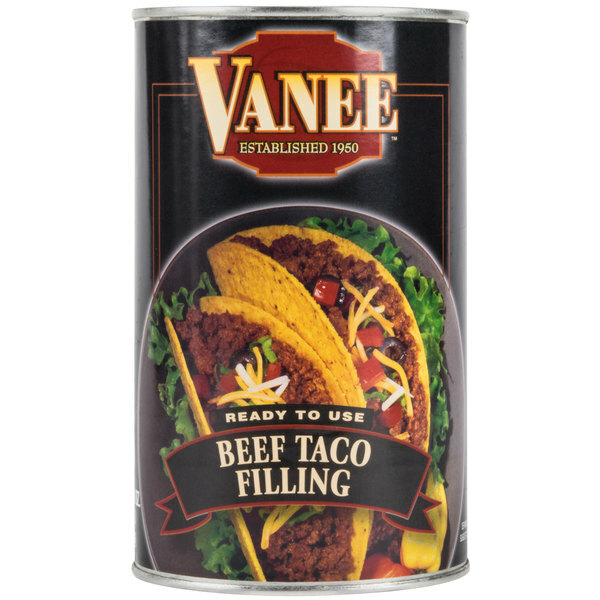 Instead of preparing beef taco filling from scratch, lessen the labor, prep time, and materials with this ready-to-use Vanee product that does not sacrifice a wholesome, homemade taste! 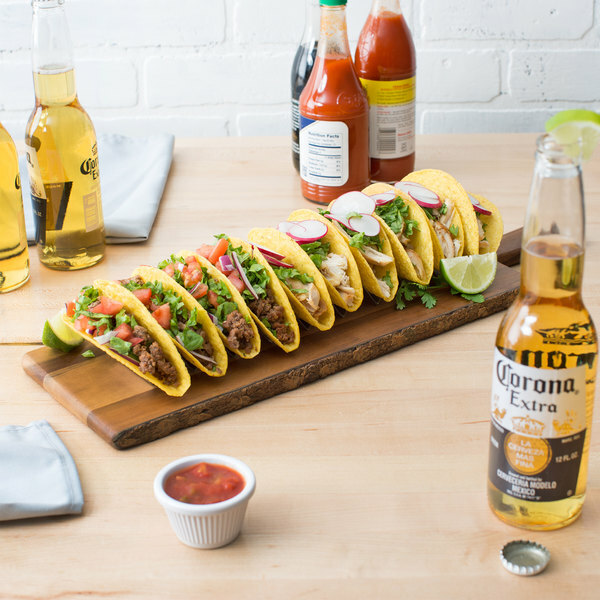 Treat customers to taco filling in authentic Mexican or Southwestern-inspired dishes for a true flavor experience! This is a LOT of meat, but if you are preparing tacos for a party there is no better choice, really. The meat is delicious on its own as well and the quality is much better than what you get in big fast food chains. You won't believe this meat comes from a can. This is the best taco meat I've ever eaten. It's as good, if not better than mom used to make. A great quality beef taco filling that is great for making our loaded nachos. We are limited on prep space so the precooked beef is super. The beef taco filling is great and a very good quality. It is a quick and easy way for us to prepare beef nachos at our concession stands around the ball fields. 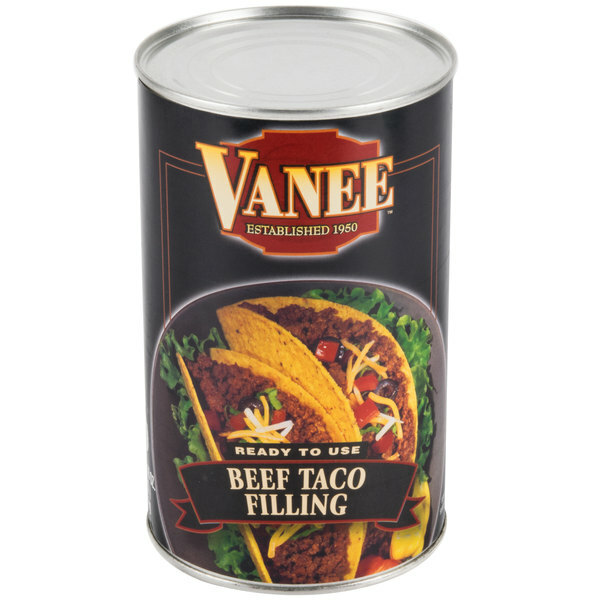 A great buy and find with the Vanee beef taco filling. The beef taco filling is seasoned perfectly and makes a great addition to our taco buffet. It makes our job a lot easier. I ordered this item for home use. It was surpassed my expectation. The flavor and texture is wonderful for many dishes. I added it to an basic pastaroni cheese dish and it worked perfectly. The sodium seems high in taste at first. A little goes a long way. After adding to the inexpensive pasta side dish there was no need to add salt. Only pepper, fresh garlic , onion and topped with cheese. It could actually be served as an entree with a side salad. I was able to fill three pint size freezer bags with the remainder. It is perfect to be able to grab a bag from the freezer and add for inexpensive mexican rice dish, taco, burrito's or let yourself get creative. Remember, the saltiness will be deluted when adding to a dish, so no worries about it. I highly recommend this! You can't have it any easier than this. It would not be a bargain if it didn't taste good but it does. It makes good tacos, tostadas, and more. Very impressed !! Good price, quick shipping, and good packaging ! Make planning dinner very easy, keep a couple on hand so when I forget to plan ahead for a meal. Will be ordering again ! Yup this tasted just like a restaurant! I thought it was perfect! Not to spicey. We had a new years day Fiesta Party and it was a hit. I am ordering more and freezing some. I can now have a Taco party anytime. No more mess of cooking the meat. Thank You Webstaurantstore for selling this in a single can. The taco filling is a bit salty, but when added to the peppers and onions, salsa dip, and/or the pasta sauce; it evens out the saltiness and one does not have to add more salt. I recommend this product for its taste and price, but would like more in the can. I was a little hesitant buying taco meat in a can but I'm so glad I did, the flavor is identical to home made taco beef without the mess or guess work. this is a superior canned meat product and should be given a try at least once. Very tasty beef taco meat. I didn't think it was to spicy neither did my husband that hates spicy foods. Much cheaper than some of the big box stores around where I live. Had a Mexican themed event and this product went well! The guest loved it on their tacos and they returned many times for more. Its a great product because the seasonings already packed in there. I highly recommend this for your taco party! I wish I could rate this with more stars. I got this product to use as a base for MY taco filling. After trying this meat, and yes, it is all meat, I had nothing to add. It is perfect right out of the can. If you are considering a case, you might try one can first. A lot of people may love this product, but we found it too spicy. Thank you for your review! We're sorry to hear you did not care for the flavor. Seasoned with hot sauce, this taco filling does have a spicy kick.